Everything happens on ’19’ ? There is something special about ’19’ this year in Karachi as far as the weather of the city is concerned because since April, every ’19’ is bringing a changing weather pattern to the Metropolis either in the form of dust storms or rain. It is worth mentioning that dust storms are very rare in this part of Pakistan but the 19 phenomenon has made it common. If you happen to believe in the astrology then look no further as 19 will be the lucky number of every Karachiite. Astrology means “the Science of the Stars”. 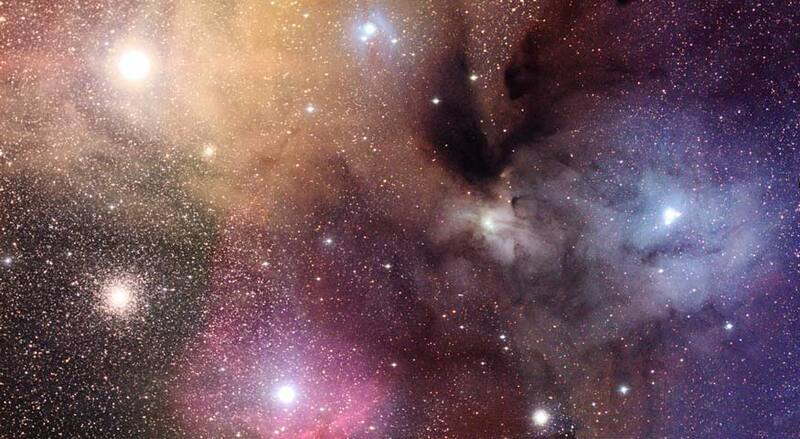 It has idea of an organised thing of knowledge of the cosmos, along with the way the stars “speak” to us. Few astrologers have brought the concept of ‘lucky number’ into Astrology that could be easily seen on Television these days. But this article is about ’19’ weather events in Karachi! so lets get back to the topic. On March 19, 2012, a dust storm hit the city that caused 65 km/h winds to blow in the city while the visibility dropped to just 200 metre. It had the qualities of a sand storm. On March 18, the intensity of the storm was moderate to strong especially in Balochistan where the winds of 130 km/h occurred that caused trees to be uprooted. In Sindh, many cities were affected that included Karachi, Hyderbad, Jamshoro, Sukkur and Kashmore. Strong winds destroyed billboards and uprooted trees in the cities of Interior Sindh. However there was no death in the province of Sindh. Karachi experienced the highest wind of 65 km/h during the night of March 19 while the visibility dropped to 200 metre, storm hit the city at about at about 5:08 pm. Many flights both international and national were suspended. An Anti-cyclone persisted over the Iran on March 17 while a fresh western disturbance ’27’ was moving over the northern areas Afghanistan, that caused the dust particles hanging over the Arabian states to move into Afghanistan and adjoining Balochistan. Past Satellite images did indicate that Dust storm first affected United Arab Emirates, Oman, Iran and Afghanistan before moving towards western Pakistan on March 18 in Balochistan. On March 19, it started to move towards Sindh though it had weakened by that time. On March 20, it moved towards Punjab, Gujarat, Rajasthan and adjoining Arabian sea. April 19, 2012 – The Light rainfall ! On April 19, it rained (5 mm) in the city with strong winds (60 km/h). It all started from April and it was not an April fool joke, drizzle in the month of April is very rare in Karachi. The highest monthly rainfall of 52 mm was recorded in 1935 in the city. The two important factors for April rain was that is was the first rainfall since 1997 while the another reason was that a thunderstorm formed such south of the country since December 2006. On May 19, 2012, a dust storm gripped the metropolis with highest wind of 72 km/h. Dust storms hit Karachi on May 19 at about 7:12 pm PKT and lasted till 7:30 pm PKT, the dust storm was generated by the same storm that wrecked havoc in Sindh earlier in the afternoon. 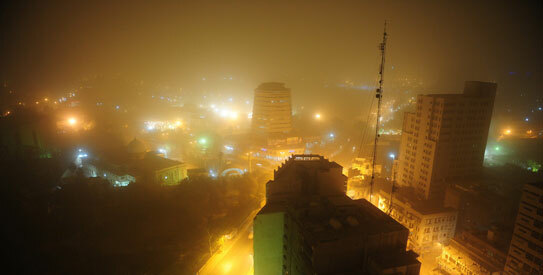 Several people were injured due to the dust storm that hit several parts of Karachi. Airspace was temporarily shut down as the visibility to half a kilometre. Western Disturbance 06 persisted till May 22 over the northern parts of the country, it brought a sudden dust storm in north-western Sindh including Karachi on May 19 as a high pressure system formed over Balochistan and adjoining Sindh that brought winds from north-west. Hailstorms occurred in Dadu city on May 19 mid-day. 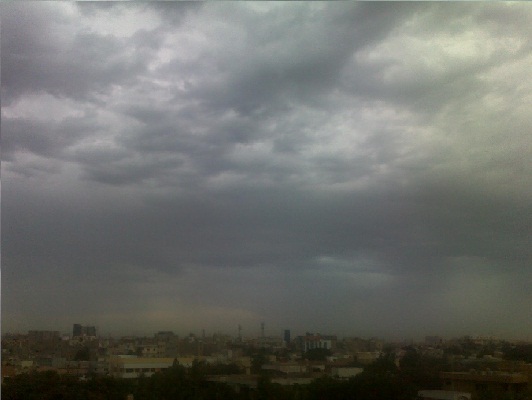 On June 19, 2012, drizzle occurred in few parts of the city. During the evening, the wind pattern changed to NW/WNW as the wind gusted to 48 km/h and around 7:30 pm PKT, light drizzle occurred in the city that lasted for few minutes. Western disturbance 10 entered northern Pakistan on June 18, it was weak in intensity and caused monsoon to go on break. 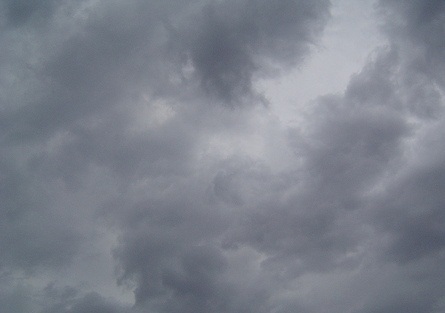 It disturbed the pre-monsoon activity in south-eastern Sindh. 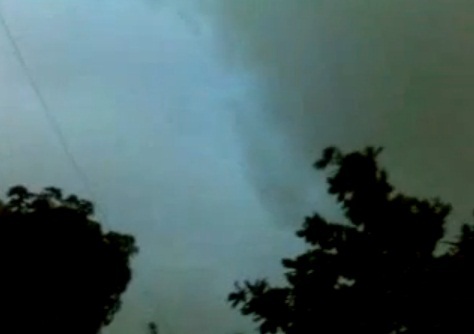 WD 10 caused light showers in Lahore on June 19 as it was situated over Indian Kashmir. July 19: Something big coming? What will happen tomorrow? Will we get a sudden dust storm or a rainfall? Although it appears that the conditions would remain stable with chances of drizzle/isolated shower but what if some big thing happen in the metropolis or it stays the same! 19 is 1 and 9 therefore 1+9= 10; 1-9=8. Adding 10 into Karachi’s lucky number 19 that makes 19+10= 29 while 8+19=27. Wow! So the first monsoon rainfall is expected around July 27/July 29? Only time will tell! ← PWP Facebook completes one year! Kindly check the latest Pakistan Weather Update on home page..